You will be able to add closed classes online using WebAdvisor! No more standing in long registration lines! Wait while the Schedule Builder loads in a new tab. Select the Term from the drop-down at top left. Input your search term in the text entry field to the right of the 'Section Name' drop-down menu. Select the class from the search results that appear by clicking on the 'Section / Description' link. 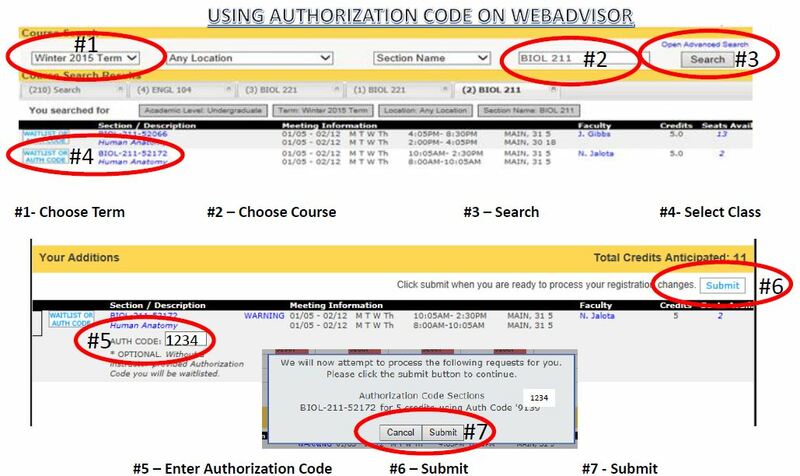 Enter the Authorization Code you received from your instructor in the short field that appears under the 'Your Additions' section. Click 'Submit' on the right side of the screen. A pop-up will appear. click 'Submit' in that pop-up to finish and add your class. NOTE: Authorization codes are valid until the last day to add a class with instructor permission – refer to the Important Dates and Deadlines for dates. Deadline dates vary for short-term classes.